This recipe is perfect for those hot, summer days when you don’t want the oven on for ages. This roasted garlic prawns recipe is featured on the website The Pretty Blog, and includes flavours like chilli, garlic, ginger and parsley. The authors recommends serving the roasted prawns - which only take around 20 minutes to roast - with a glass of chilled white wine and some bread to mop up all the tasty juices. Lovely. You can buy harissa paste in supermarkets - it’s a Moroccan spice blend which has a sweet, spicy and slightly smoky flavour. It’s great with chicken or fish - but it works especially well with lamb. Just take 1 tsp of harissa paste (use a bit more if you like it extra spicy) and rub it into 4 lamb cutlets. Season with a pinch of salt and drizzle with olive oil. Sear the lamb in a frying pan for 1-2 minutes per side, until just golden, and transfer to a roasting dish. At the same time, drop a couple of handfuls of cherry tomatoes into the dish and drizzle with olive oil, a pinch of salt and a splash of sherry vinegar. Roast in a 200ºC/gas mark 6 oven for 15 minutes, or until the lamb is just cooked and the tomatoes are soft and slightly burnished. 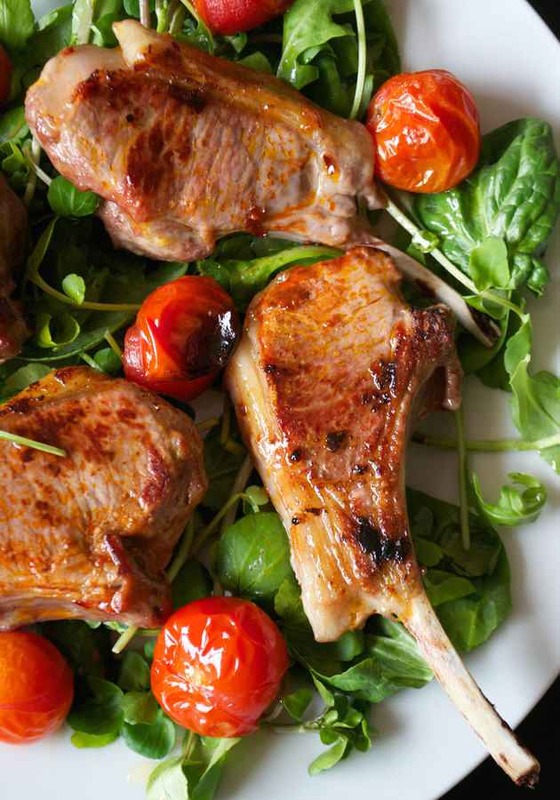 Serve on spinach, watercress and rocket leaves - the juices from the tomatoes and the lamb will serve as a dressing for the leaves. 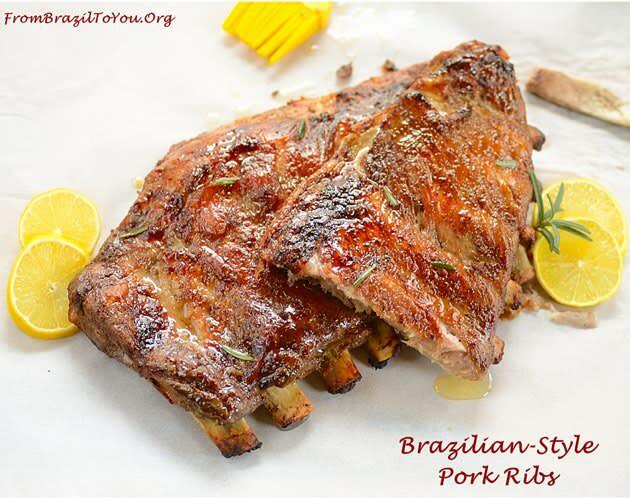 Here’s an interesting idea for a summer roast - Brazilian pork ribs, marinated in delicious things like cumin, oregano and garlic. If you’ve never cooked Brazilian food before, then this is a good one to start with. The ribs cook in a couple of hours but you don’t need to be doing anything during that time - the oven will take care of it for you. Give a roast chicken dinner a summer makeover with lemon, thyme and leeks. Just wash and trim a leek, chop it into chunks and arrange in a roasting dish. Season with a little salt and then add the chicken portions on top. Tuck lemon halves in and around the chicken and scatter with fresh thyme. Season with salt and pepper, drizzle with olive oil and roast in a 200ºC/gas mark 6 oven for 35-40 minutes until the chicken is golden and the skin is crisp - and cooked all the way through. 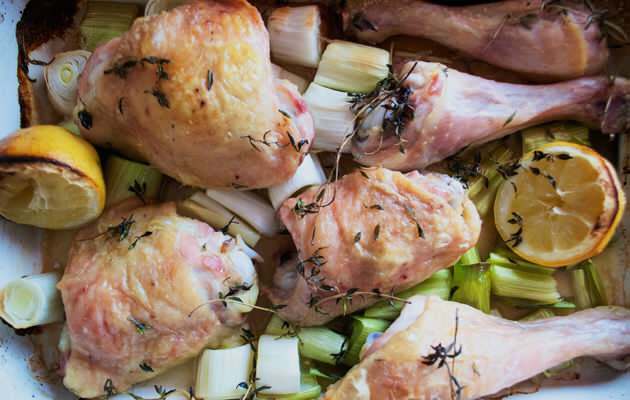 The leeks take on the flavours of the chicken as it roasts - don’t waste them. Meatloaf or Beef Wellington? Well, thanks to Reeni from the blog Cinnamon Spice and All Things Nice, you can have both. 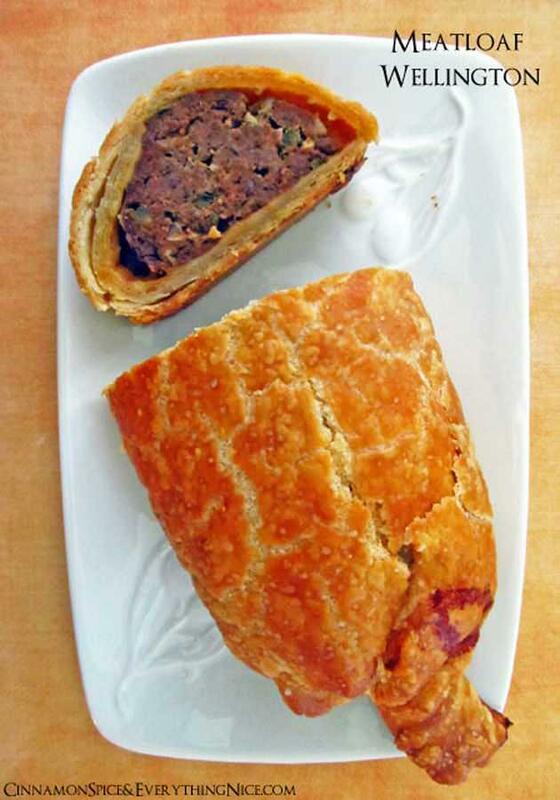 This Meatloaf Wellington would be delicious sliced and eaten with a big crisp, green salad on a hot day. Reeni reckons it’s lovely sliced and eaten cold from the fridge, too (which is always a bonus). This summery roast takes just 20 minutes to cook and is beautiful served with new potatoes and greens. Slice 2 fennel bulbs and scatter the slices in a roasting dish that the fish will fit into. 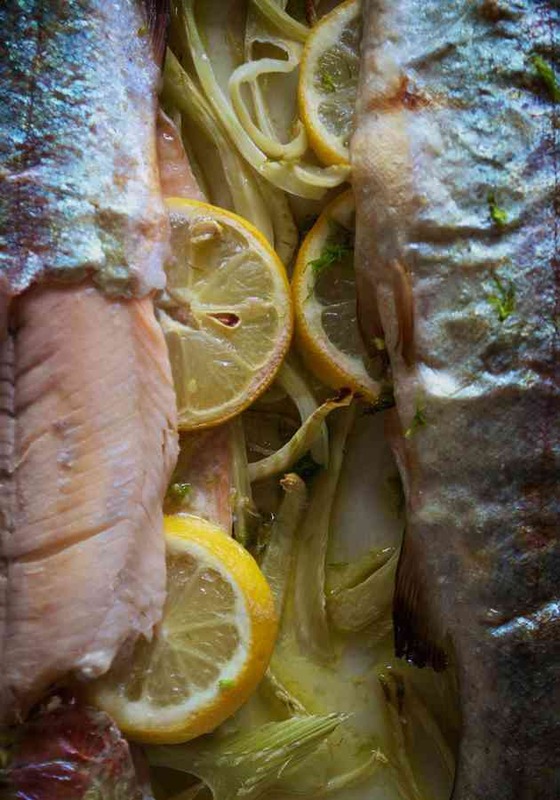 Lay two ready-to-cook whole trout over the top of the fennel. Slice 1 lemon and tuck the slices into the cavity of the fish, seasoning with salt. Add a dash of Vermouth along with a drizzle of olive oil and dot 1 tsp butter over the top of the fish. Slide into an oven heated to 220ºC/gas mark 7 and roast the fish for 20 minutes, or until cooked through. Serve with the buttery juices spooned over the top. Here’s a vegetarian option that’s light, colourful and has a range of flavours and textures. 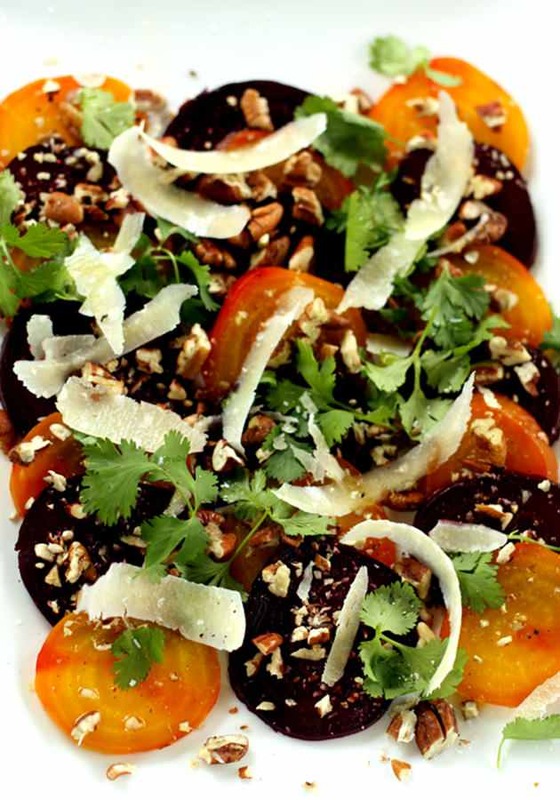 This summer roasted beet salad was created by Rachel, who writes at the blog Tokyo Terrace, and includes not only beetroots but Parmesan cheese, pecan nuts and coriander leaves. The beetroot takes around 30-45 minutes to roast. Do you have any favourite light, summer roast dinners? Let us know on Twitter.